It’s not very mature of me but I get irritated when my comments are rejected by moderators, particularly when I have put more than 5mins effort in. So rather than waste the effort I am posting my comment to Myles Allen’s article The Green New Deal: One climate scientist’s view, from the other side of the Atlantic here. OK, a high carbon price but cars must go. The “carbon budget” is an estimate of how much CO2 we can still emit, but still have a good chance to keep global warming from going over the 1.5°C limit into “dangerous” territory. The budget has recently been revised (upward, thank goodness) to about 420 GtCO2 (420 billion tons of carbon dioxide). Staying within the 1.5°C limit doesn’t make us “safe” — there are still consequences of climate change, dangerous and costly, and we’re already paying the price despite not having hit 1.5°C yet. But going above 1.5°C takes us into what is best described as: nobody wants to go there. I watched this a few month ago. Took up the offer of sending in questions. No answer yet. Q1: What is a reasonable remaining carbon budget (in CO2e) to keep within 1.5°C (or 2°C)? On a per capita basis, how does it compare with average world yearly emissions? How much more than this are average European emissions? Q2: What’s the current thinking on the radiative forcing index for aircraft emissions? Is there a Hansen’s Faustian bargain with aircraft emissions because in the first few decades air flights cool the Earth? Q3: Can the global carbon intensity of production be reduced fast enough to save the climate and avoid de-growth? If GDP needs to be constrained there is full employment, labour productivity must be constrained. This means wages are constrained. How can the incomes of the low poor be supported? Q4: In reference to BECCS (and more generally), has anyndetailed work been done on the albedo effect of biomass planting? e.g. Has there been work to find crops with “good” albedo? Q5: What do the panel think of solving fuel poverty by taking from the rich to give to the poor? Has anybody considered that to heat houses requires heating hundreds of cubic metres of space to warm people that occupy a few metres each? Q6: Would the panel demand high profile governmental campaigns to tell the public the effects of their everyday actions? Would a more detailed version of How bad are bananas? by Mike Berners-Lee help? Q7: Is mass car ownership compatible with saving the climate? Q8: In assessing green house gas emissions what is the appropriate weighting for methane compared to CO2? Occasionally I have a comment on another blog rejected. This will be a list of those I want to follow up. To save the climate degrowth is needed. Subsidise the wages of the low paid. Take from the rich to give to the poor. The rich most responsible for greenhouse gas emissions. Or did I overdo the links to one of my own blogs? I’m keen to find out – I rather like London Economic. Like most people, I live on land, not at sea. I even live in the northern hemisphere. Global warming isn’t the same everywhere. In particular, it’s happening faster on land areas than over the oceans. While the globe as a whole is warming at a rate of around 1.7 to 1.8 °C/century over the last several decades, the land areas alone have been warming up more than 50% faster, at about 2.8 °C/century. 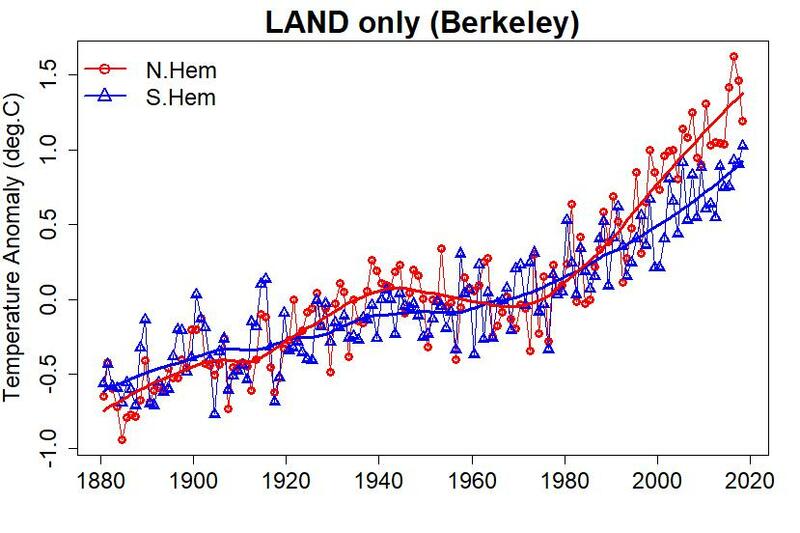 And of course, not all land areas are warming at the same rate either. On the whole, the northern hemisphere land is warming faster than southern hemisphere land; here in the north we’re heating up at around 3.2 °C/century (for land areas, I like to use the data from the Berkeley Earth Surface Temperature project). One of those things, which happened to come up in conversation recently, is that climate change has its most profound effect on extreme events. Climate change is a change in the probability function (the odds for each possible outcome) of weather, and when you look at probability functions you find that if they change in the way we expect them to, it can increase (or decrease) the chance of extremes by a surprising amount.